Amazon hasn't said yet which phones Whispersync will work on. It would be great if Whispersync worked on the upcoming Palm Pre. I don't have a Kindle but I wouldn't mind having one. Even though I'm quite happy reading ebooks on my Palm smartphones and the iPhone, the Kindle's larger screen would be nice. And I'm always happy to find an excuse to get another gadget. I'll surely be getting a Pre, so it would be great if Whispersync does turn out to work on the Pre. The Kindle 2 also does not have a backlit screen. 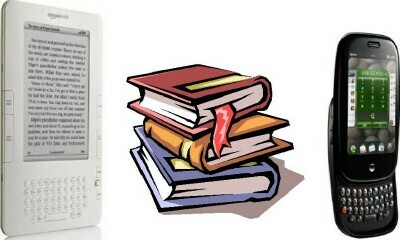 I depend on my Centro's backlit screen for eBook reading when reading in bed at night. The backlit screen keeps me from having to turn on a lamp which would disturb my husband. My husband cannot stand to hear paper rubbing against anything, so another great thing about eBooks in general is that you can turn the page silently. Barry used to complain all the time when I would read a real book in bed because everytime I'd turn a page, the page would scrape against my shirt or the covers. From reading through the Kindle forums over at Amazon, I discovered that some original Kindle owners are saying that the Kindle 2 won't have a user replaceable battery. So that's another plus for our Palm smartphones in terms of pro's for using them as eBook readers. If you're interested in eBooks, John Siracusa over at Ars Technica has written an excellent article which looks at the past, present, and future of eBook readers. John used to work for Palm Digital Media, originally called Peanut Press. The eBook store is now called eReader.com and was bought by Fictionwise.com. Anyway, John certainly knows the ups and downs of the eBook business and his extensive article was a great read!